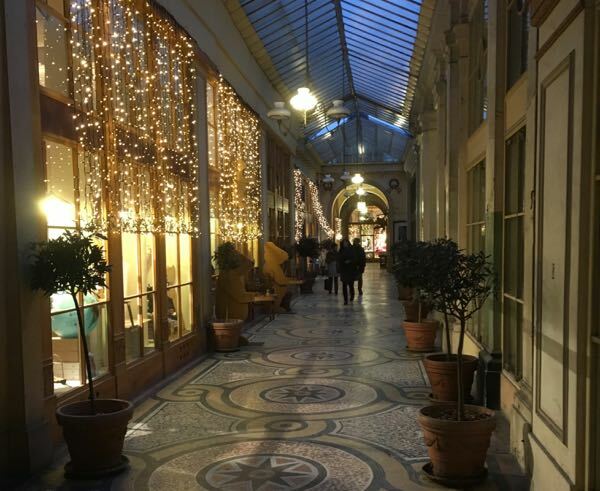 Many times I’ll choose a place to visit in France simply from seeing a beautiful photograph. 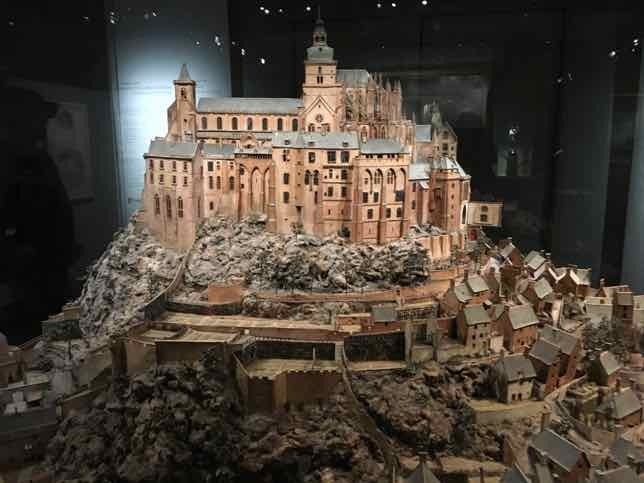 This has happened with Mont Saint-Michel, Etretat, and recently Pont d’Arc, which is located in the Ardèche department. Pont d’Arc is a 60 metre high natural limestone arch [“pont” means bridge] located in the town of Vallon Pont d’Arc and it is the gateway to the Ardèche canyon. The town is extremely popular with summer vacationers who are looking for water activities. 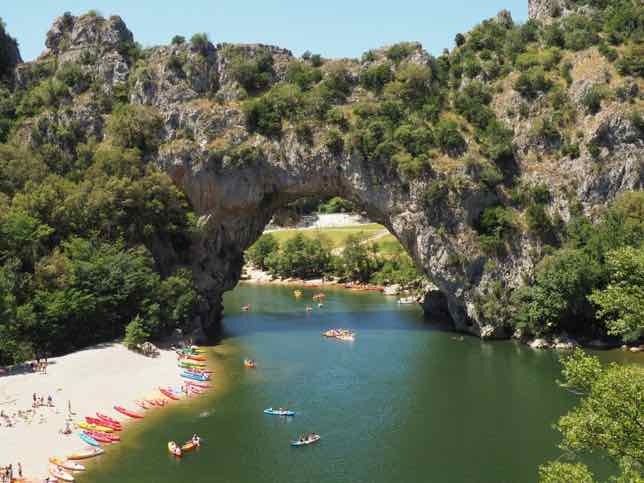 There’s nothing quite like paddling on the Ardèche river under the arch. If you’d like to explore this area, I highly suggest you discover Pont d’Arc by kayak or canoe. I rented a kayak and LOVED it, but I do have some advice. 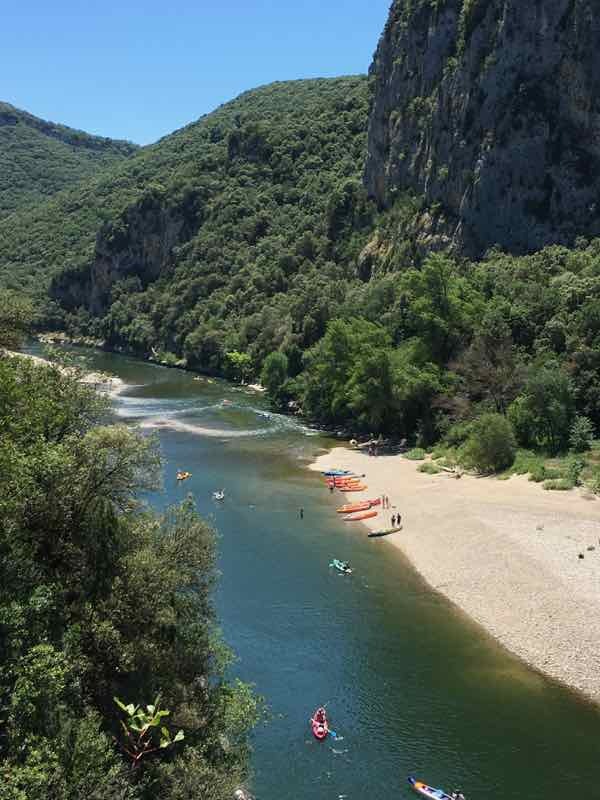 In Vallon Pont d’Arc there are numerous canoeing and kayaking companies. I signed up with Locacano Sports in Salavas, because it was located near my Bed and Breakfast. The companies in the area are very competitive with roughly the same prices. 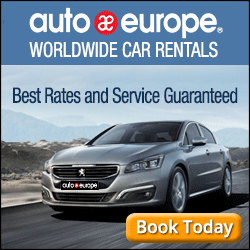 The cost depends on the duration of your rental. 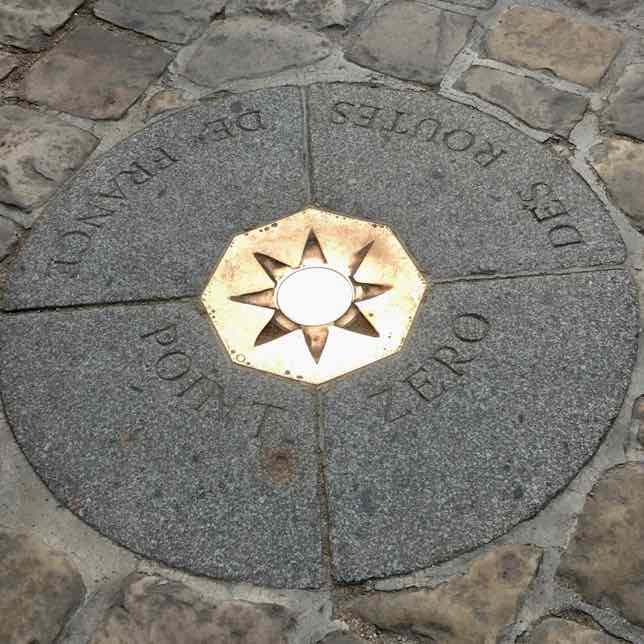 I decided to do the shortest distance which would take me from the drop off point to just past Pont d’Arc. There was no required duration. I simply had to indicate when I’d like to be picked up at the pick-up point. If I were staying longer in the Ardèche I would have taken a longer time, pulled over on one of the sandy beaches, and had a picnic. I decided I’d do the half-day, 8km distance (usually takes 1.5 hours) but gave myself a couple of hours. The cost was 20 Euros. The 8 km distance is perfect for novices and those who just want to take it easy. Other options include: 13 km, 24km, or 32 km. There are one and two-person kayaks and each kayaker is provided with a paddle and life jacket. 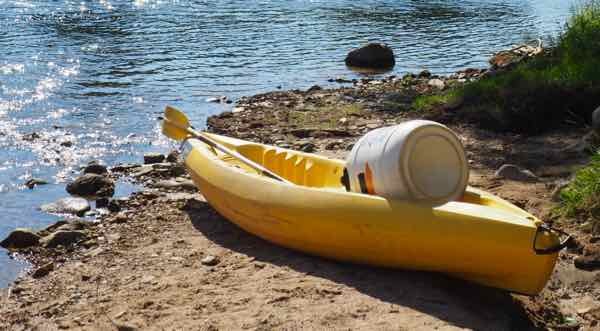 Each kayak can take a large waterproof container that looks like a barrel. It can hold extra clothes, water, picnic supplies, etc. There were also different sizes. I took the larger container so it could hold my camera and knapsack. The ONE item I brought from home that I am so grateful I had was my Mountain Equipment Co-op waterproof iPhone case. 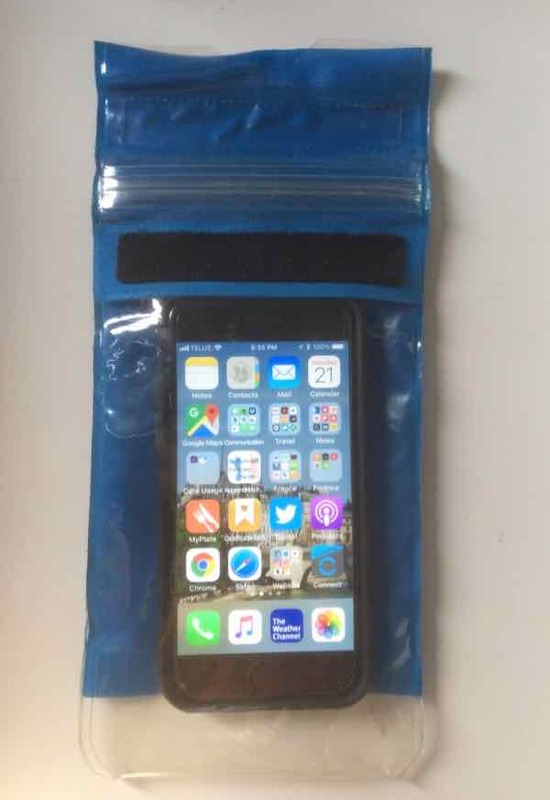 It saved my life phone from a drowning! When you are in a kayak, your container is strapped in. It is very difficult to unstrap the container, open it up, and pull out a camera or anything else. The kayak would become too unbalanced and you’d either fall in the water or your container would. There was no way I was going to keep my camera out as it was too easy to get splashed or worse, fall in the water. You will definitely get wet and while a bathing suit is the best thing to wear, shorts and a sports top are fine. Water shoes would be perfect, but I kept my sandals on as they made it easier getting into and out of the kayak. 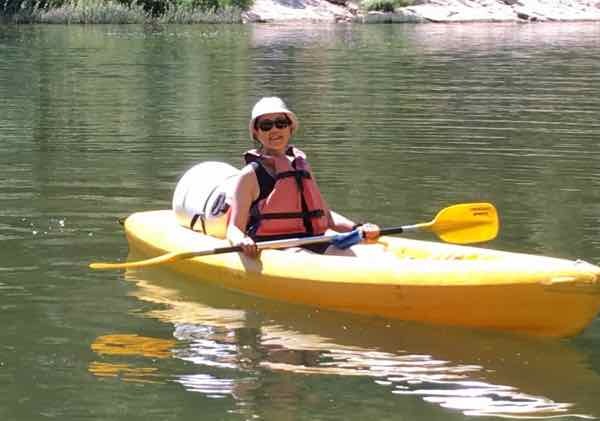 When you are kayaking in the summer, a hat, sunglasses, and sunscreen are musts. If you’re going to paddle for a longer distance or time, be sure to pack water and snacks or a picnic. Many families and couples were out swimming and picnicking on the shore. The kayak company did advise me of potential groups of rocks or rougher waters. They helped me choose the proper size for my life-jacket but did not “instruct” me on how to paddle. They assumed I knew. I have kayaked a few times but am far from experienced. So if I can kayak, anyone can. Just be aware that it does require strong upper body strength as you are paddling for a couple of hours. The journey starts in Vallon Pont d’Arc and ends at Châmes. As expected, the scenery was beautiful, especially paddling under the Pont d’Arc. Most of the time the waters were still, so it was easy to take photos. The 8 kilometre ride was incredibly quiet even though many kayakers were out and it did not feel crowded. I hit “rapids” a few times and did get stuck in the rocks twice. I had to use a LOT of force and energy to push myself out of the rocks. By the end of the 2 hours my shoulders were definitely sore. I had no problem finding the pick-up spot, called “STOP 9”. Although I’m sure I didn’t have to, I dragged my heavy kayak up the short hill to where the bus would pick me up. It arrived on time and took me back to my car in Salavas. 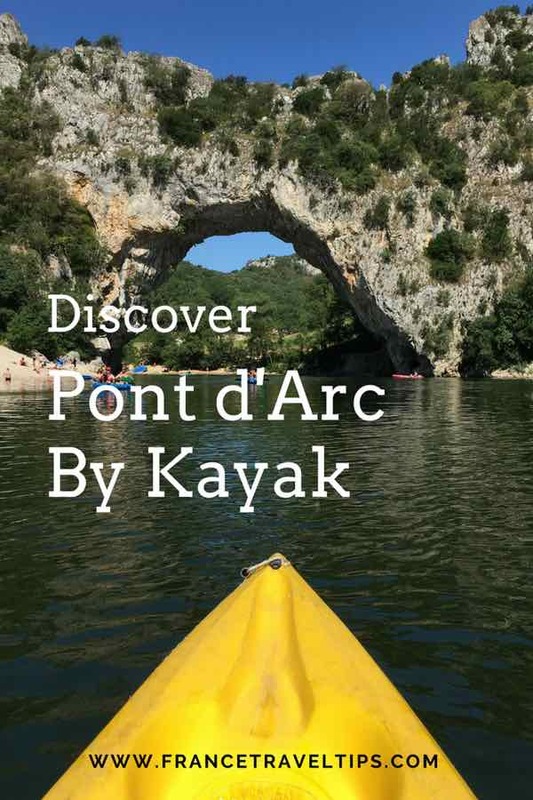 I really enjoyed exploring the Ardèche river and Pont d’Arc by kayak and would highly recommend this experience for individuals, couples, friends, and families. Make it a day and bring along your smartphone and a picnic. 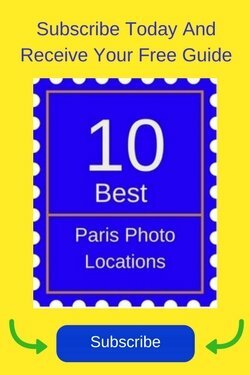 Also consider these other activities and sites in the Ardèche: What Can You See And Do For 2 Days In The Ardèche? And if you are interested in doing more kayaking….possibly under another famous “pont”— consider the Pont du Gard—- located in Provence, just west of Avignon. It’s a man-made Roman aqueduct where I have kayaked twice before (and where I attended the Feeries du Pont fireworks/sound and light show) and consider it one of my favourite unique experiences in France. How beautiful! I’ve kayaked several places in France and will need to do this next.